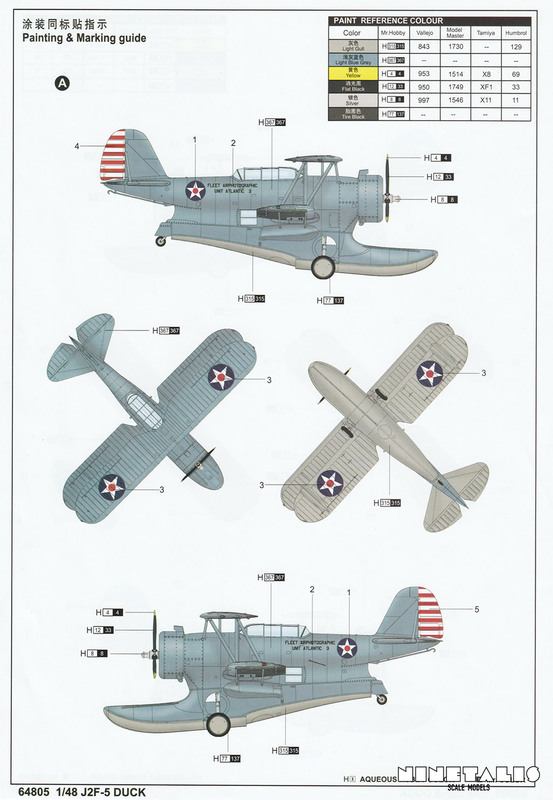 The Grumman J2F Duck was an American built single-engine amphibious biplane, used by all major branches of the U.S. armed forces. It was used for light transport, air-sea rescue, mapping, anti-submarine, scouting missions and much more. 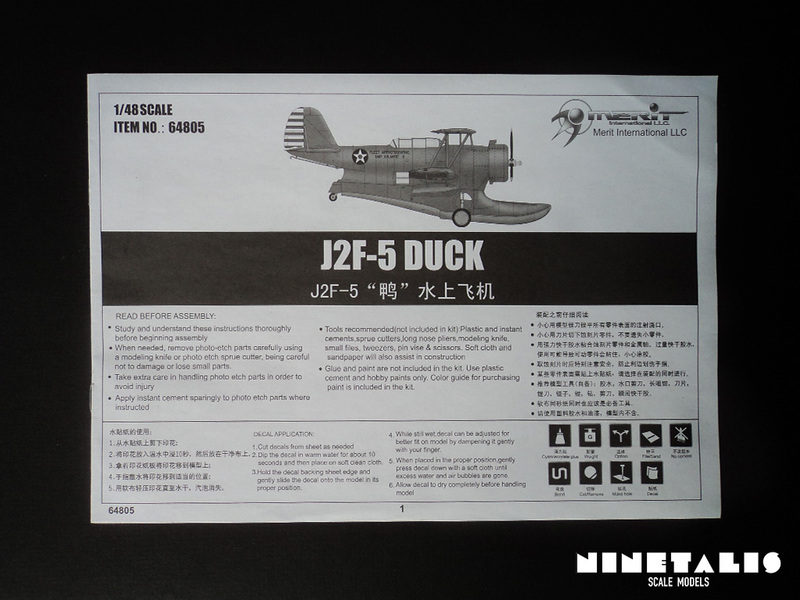 Based on the JF Duck and flown first in 1936, production started in that same year. 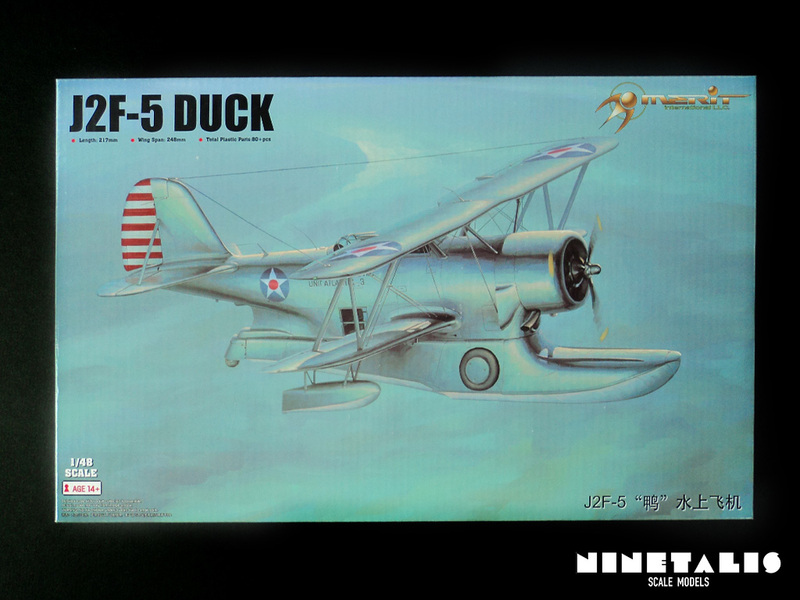 The J2F Duck was quickly introduced with the US Armed forces, as well as the Argentinian Navy who took their first delivery in 1937. The -5 variant was a J2F-2 variant featuring a 1050 horsepower R-1820-54 engine, of which 144 were built. Despite its early introduction and the quick evolution in aviation technology during the Second World War, the Duck was still in use in 1948 (and beyond), when they were converted to OA-12’s used for Air-sea rescue missions and target towing with the US air force. The aircraft remained somewhat popular during the fifties in South America operating with the Argentinian, Mexican, Columbian and Peruvian navy’s, the latter air force operating a single example as late as 1964. Information partially based on that on WIKIPEDIA, 7 FEB 2016. For me, Merit’s brand came out of nowhere in 2014 with a giant 1/48 PT Boat that I desperately wanted to have (and eventually bought). 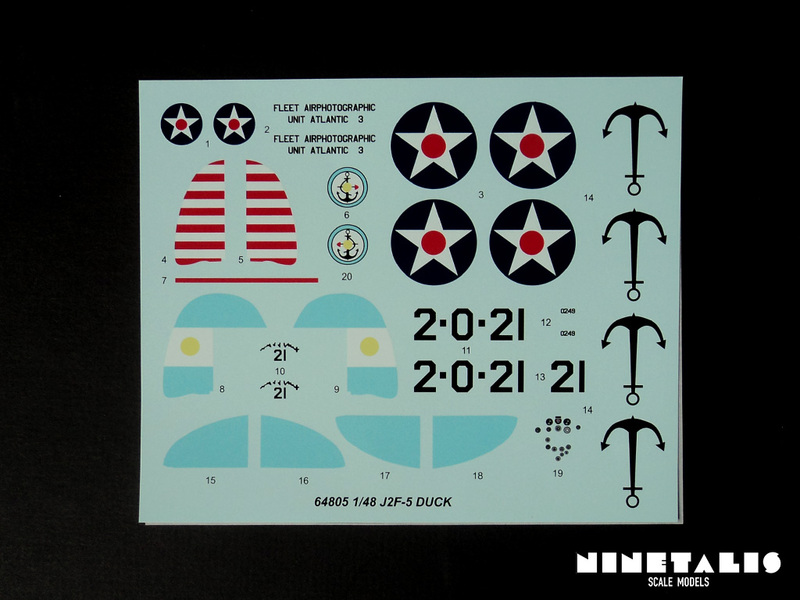 Same goes for this J2F-5 Duck kit that came out of nowhere, which I bought it on the spot the moment I saw it. Upon opening the kit it reminded me a lot of a Trumpeter kit. 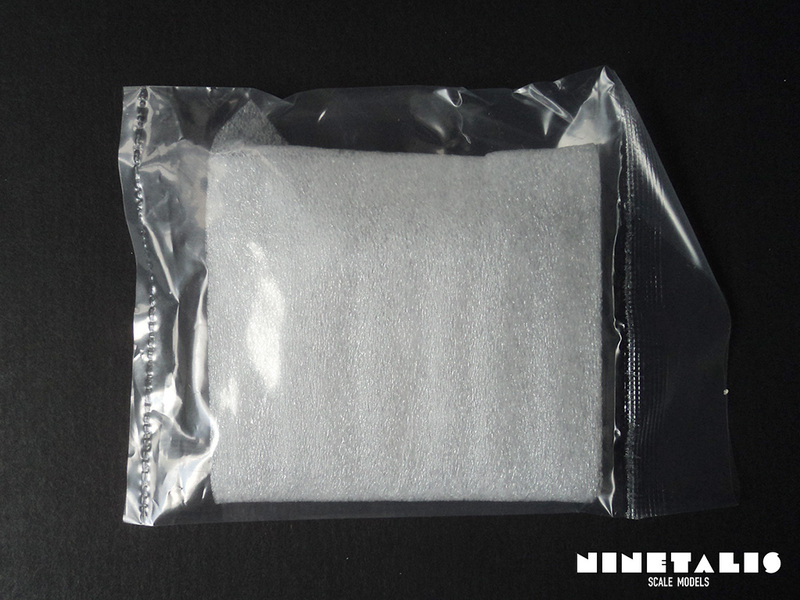 The instructions leaflet looks the same, the feels and looks of the styrene is the same, the kit and frames are packaged in the same type of box and plastic bags as that other brand. Although I’m not truly sure how the two are affiliated, there must be some sort of connection between the the two brands. 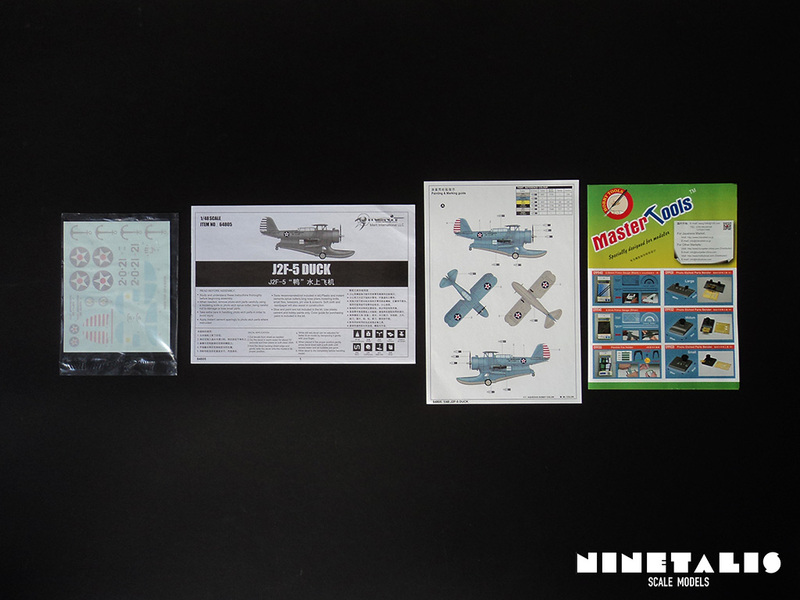 Inside we can find five styrene sprues, one clear sprue, a decal sheet, instructions leaflet, color printed markings layout and a catalogue of Mastertools’s tools (another brand of the Trumpeter-Hobby Boss holding). It might sound odd but the A sprue is split in two frames. 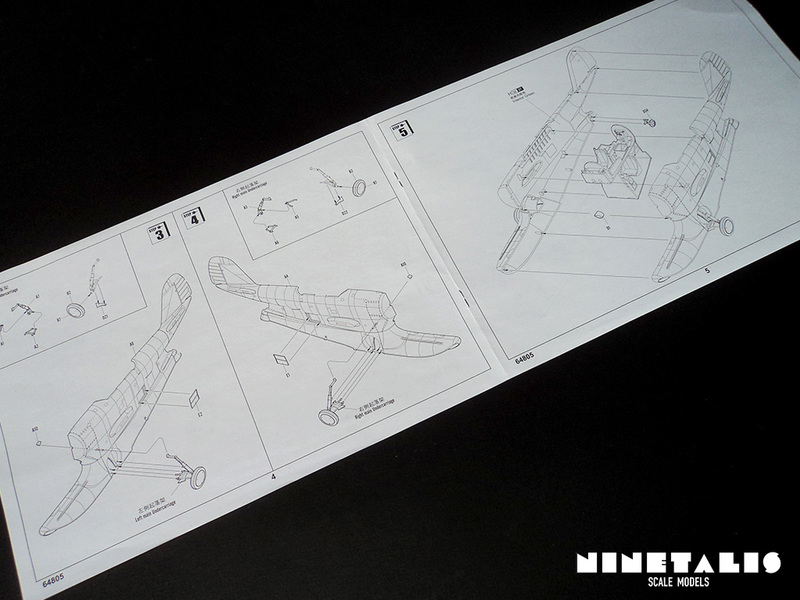 The first frame holds parts one to eight (and ten), which consists of the fuselage halves and the main landing gear. The second frame just holds one single part (part number A9), which is the engine cowling. 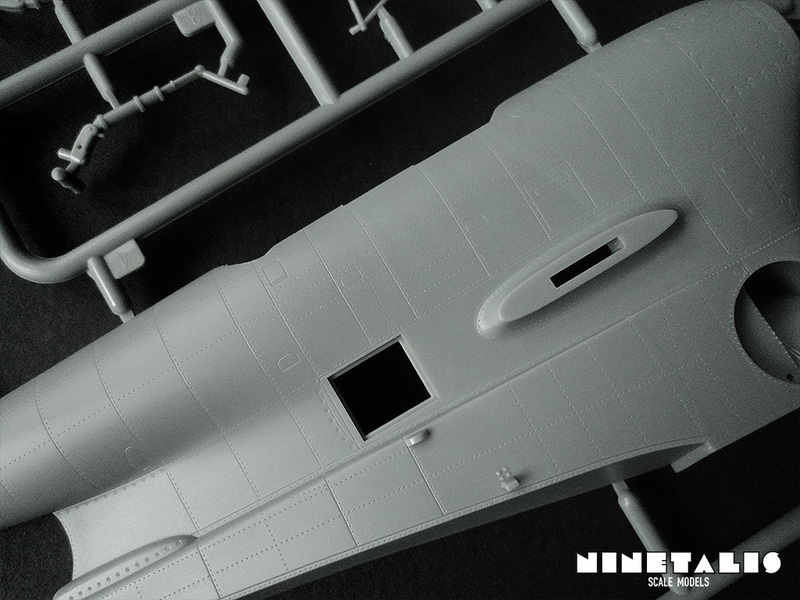 Both frames feature sharp details like recessed rivets and panel lines, as well as fuselage spars on the inside where the cockpit will go. One does have to note that these are the only parts for the landing gear, which will display the aircraft as it would be sitting on land. 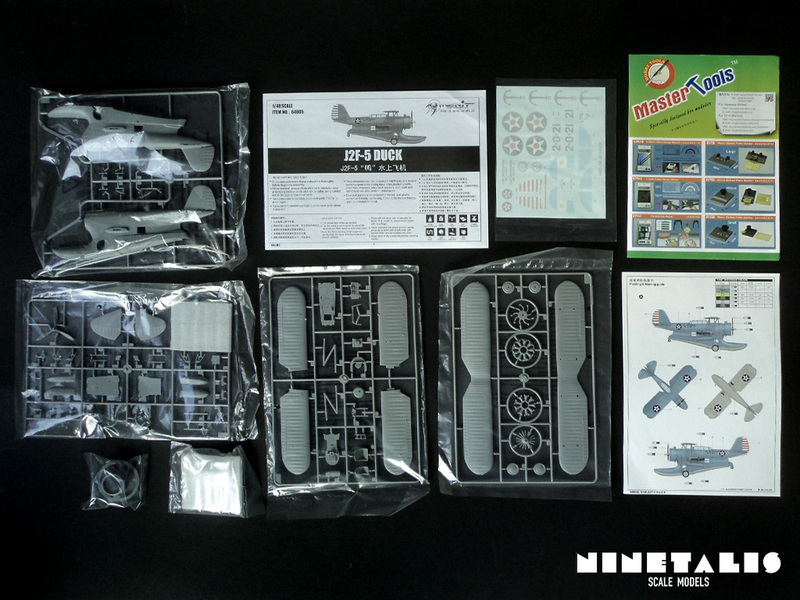 If you wish to build the aircraft as if it would be airborne or landing in water, the builder will need to adjust this himself as no such parts are provided in the kit or instructions in the leaflet. 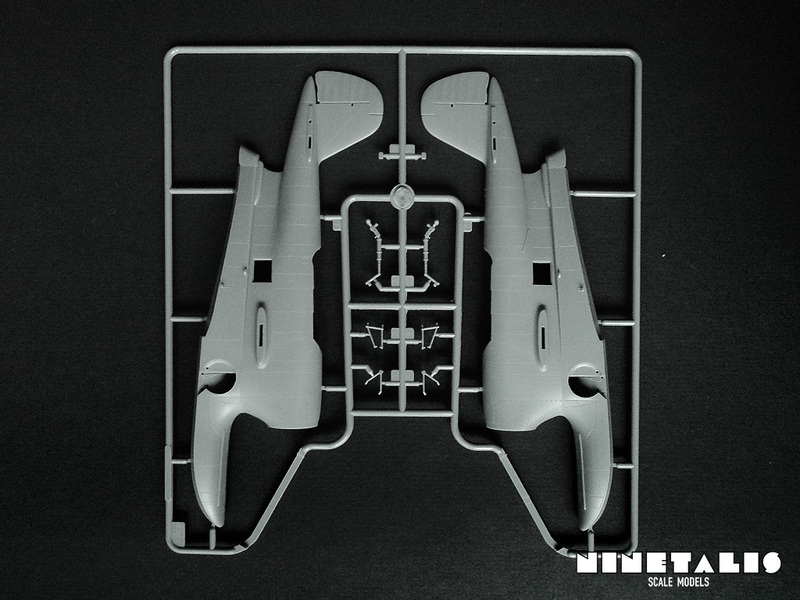 The second sprue holds the upper wing parts, engine parts and the landing wheels. 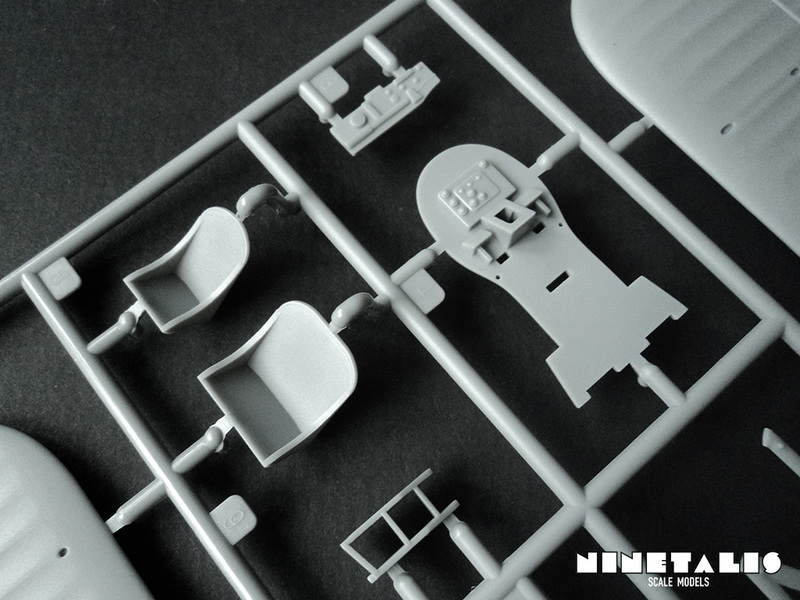 The engine is divided into seven parts, of which four can be found on this sprue. Fine details can be found on the cylinders as we should be able to expect from a new tool of this age. However, since they are split into a forward and aft part, the builder might need to clean this up a little bit if he or she desires to display the engine. The wheels also feature some fine details in the form of both raised and recessed rivets. 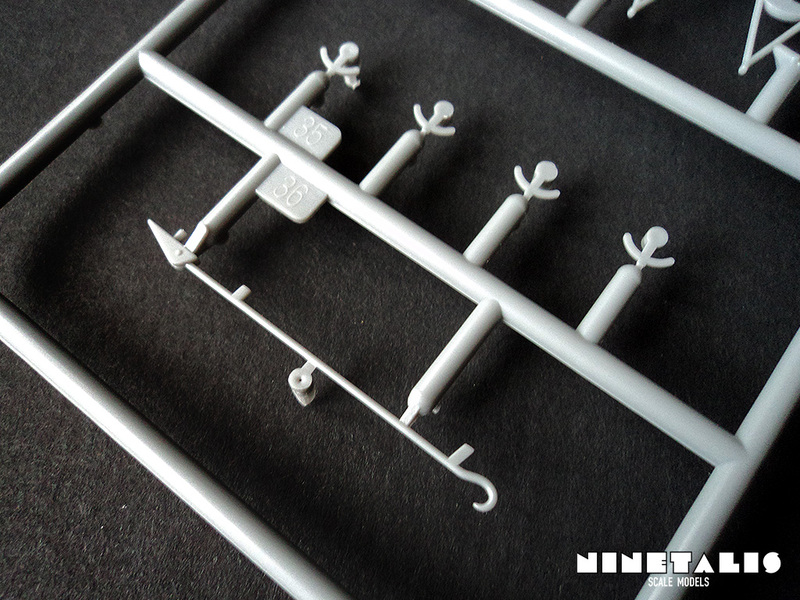 The C and D sprue hold the other smaller parts. The C frame holds the lower wing parts, pilot and navigator seat, wing struts and cockpit parts. Although the cockpit parts aren’t horrible or anything, I must say they are a little bit disappointing, as the detail could have been better and is more suggestive and rounded than sharp and realistically eyeing. 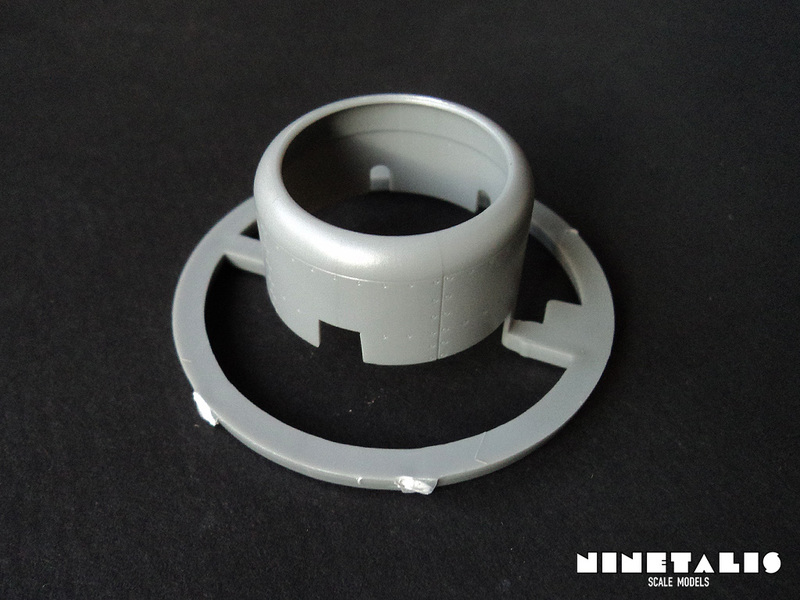 Again, it is not a drama but accuracy die-hards will probably want to address this issue, and a minimum of tiny scratch build details (or spare box parts) will go a long way. One thing that should be mentioned is the lack of the dorsal machine gun and gunner seat, which is inexplicably missing from the kit. 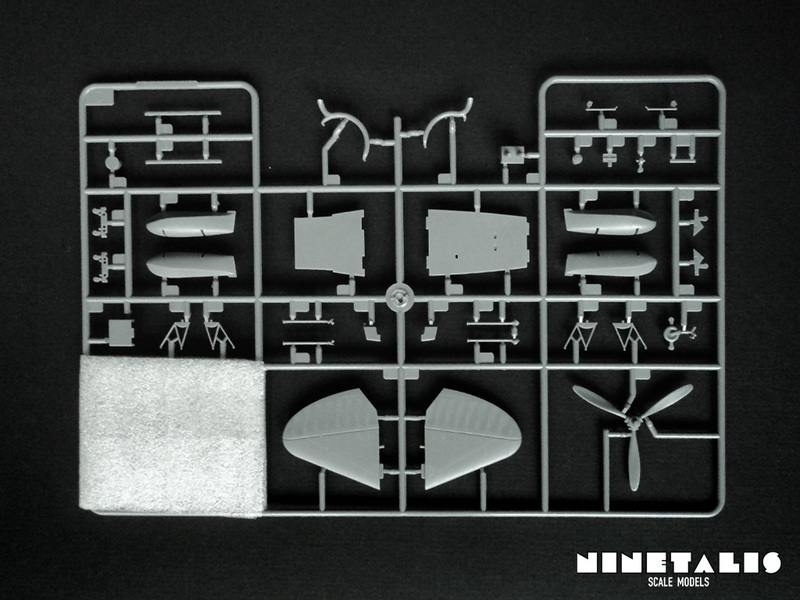 Sprue D is the final styrene sprue in our kit, holding the latter of the tinier parts in our kit like the horizontal stabilisers, propeller, wing floats, exhausts, tail wheel and wing struts. One corner of the frame is protected by soft material as the parts there are very small and fragile, which are the tail hook and parts for depth charge hard points. 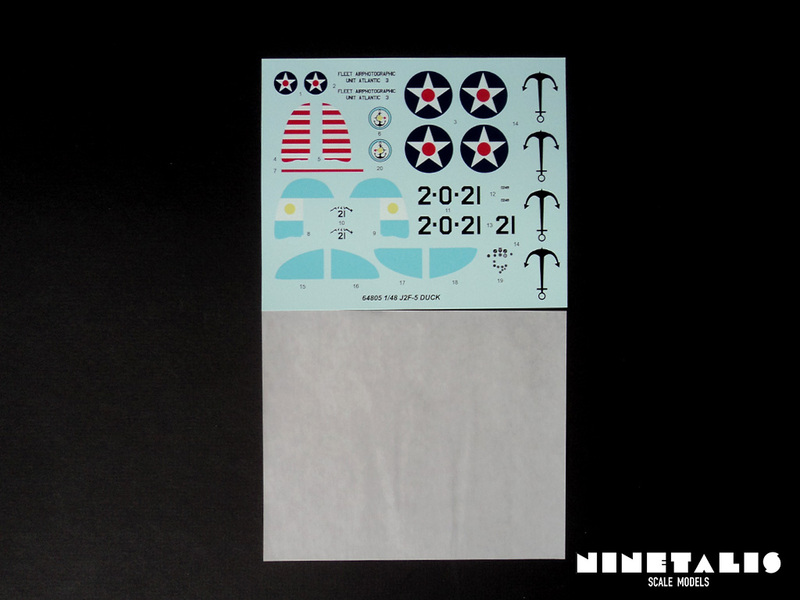 Sadly there are no depth charges added with the kit, so the builder will need to get some from somewhere else. 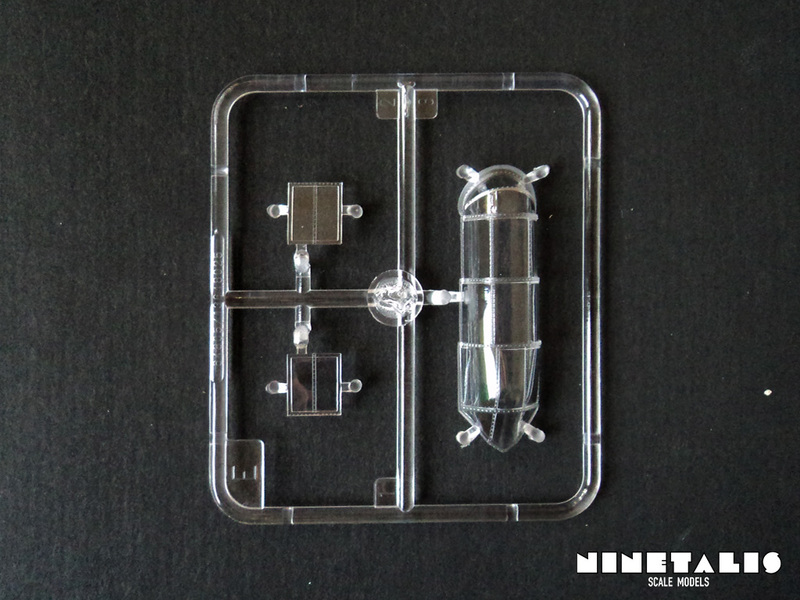 The clear sprue is carefully packaged in a single bag like every other sprue, but also packaged inside protective material. Therefore the parts are in perfect condition and damage from transporting the kit about should be extremely rare. 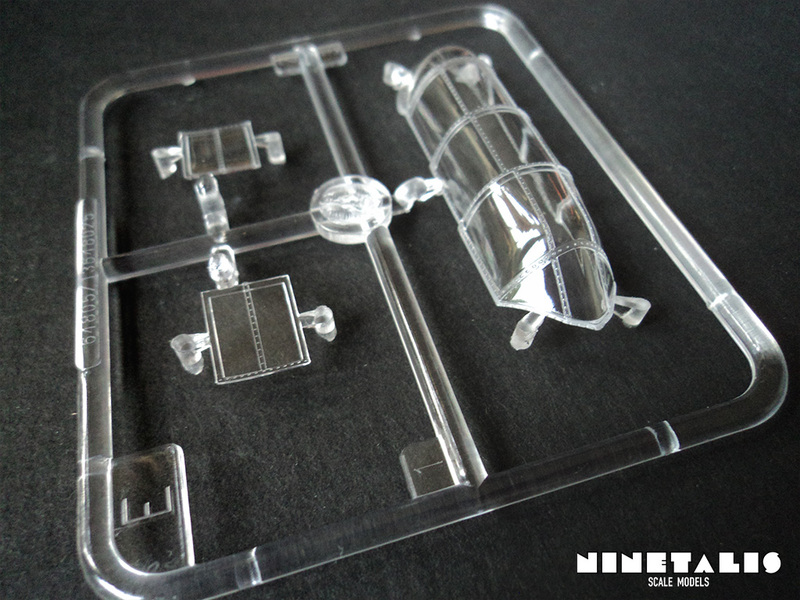 The sprue itself holds three parts, being the canopy itself and windows for the navigator’s cockpit walls. The main canopy comes in one single part, so displaying the cockpit open might prove to be troublesome. The printed materials remind a lot of the Trumpeter and Hobby Boss kits. As such we get a horizontal A4 size leaflet for the instructions and a vertical colour printed sheet with the provided markings. 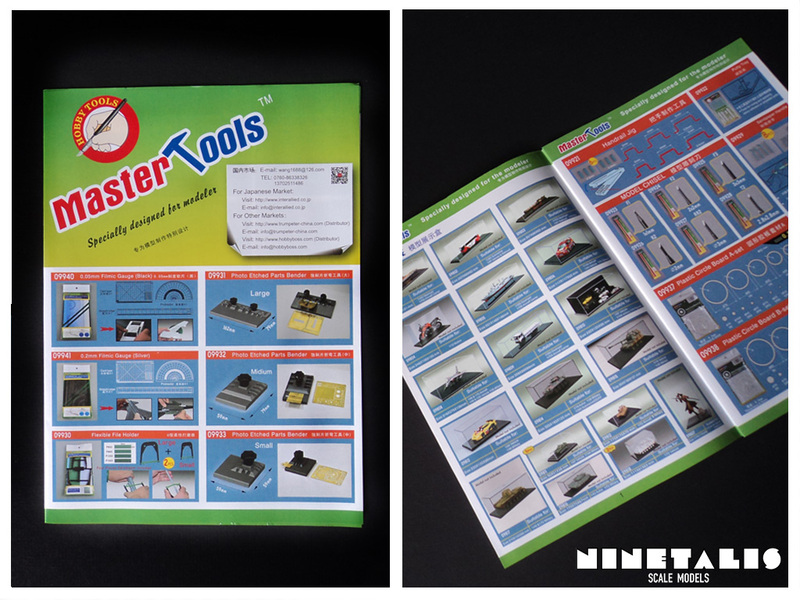 There is also the decal sheet and a catalogue of Master tools products. The instructions leaflet looks, as mentioned before, exactly like a Trumpeter instruction sheet, with computer generated illustrations for each step. The constructions are divided in ten steps, some of which feature substeps. The illustrations should be easy to understand without providing additional problems. 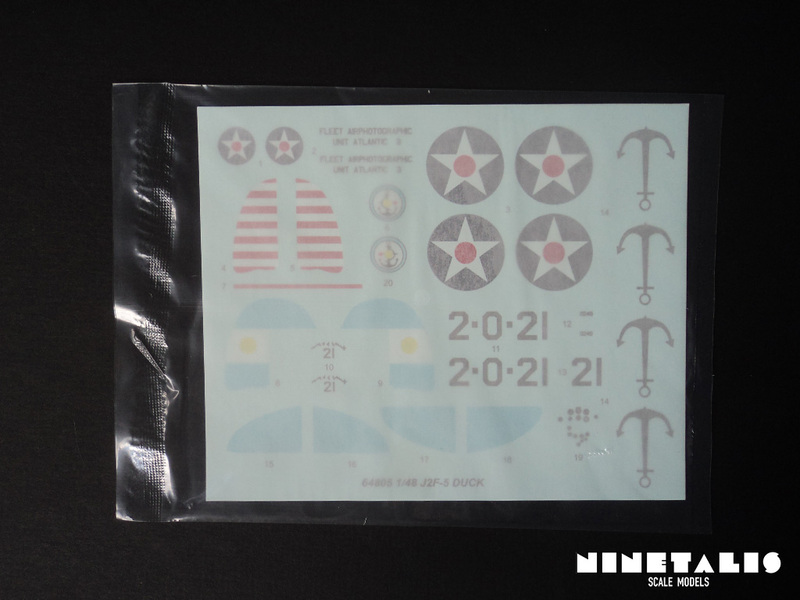 In total we get 31 decals on a single decal sheet and consist mainly of the markings and insignia’s, and are about the same quality of the modern Trumpeter and Hobby Boss kits. Silvering seems to be a little bit high on some of the insignia’s (printed colers) but overall they seem okay. The kit provides us with two marking choices. One being a US Navy aircraft from the Fleet air photographic unit 3 based near the Atlantic. It is painted in overall light blue and grey lower sides, with the pre-war markings. 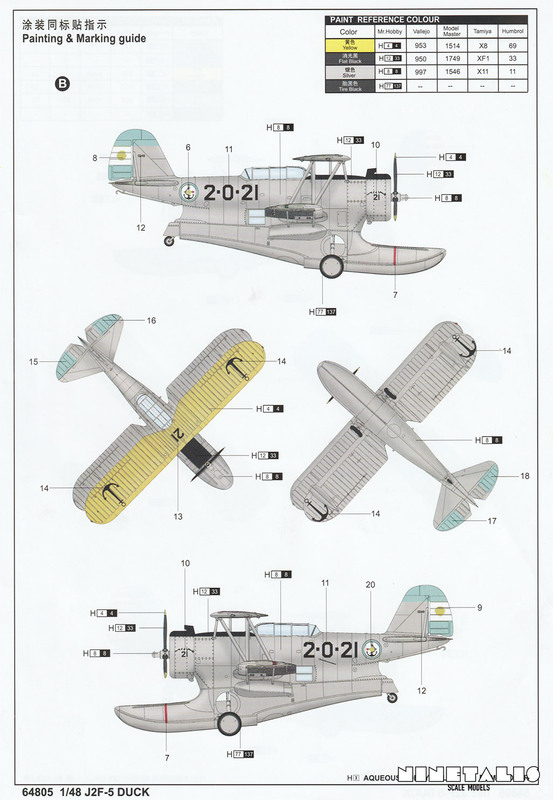 The second set of markings depict a Argentinian aircraft in overall silver and a yellow top wing with a black anti glare panel. The Argentinians acquired 24 ex-US Navt J2F-5’s in 1946–1947, together with one J2F-4 and seven J2F-6’s to add to their four 1937 J2F-4’s and eight 1939 JF-2’s. 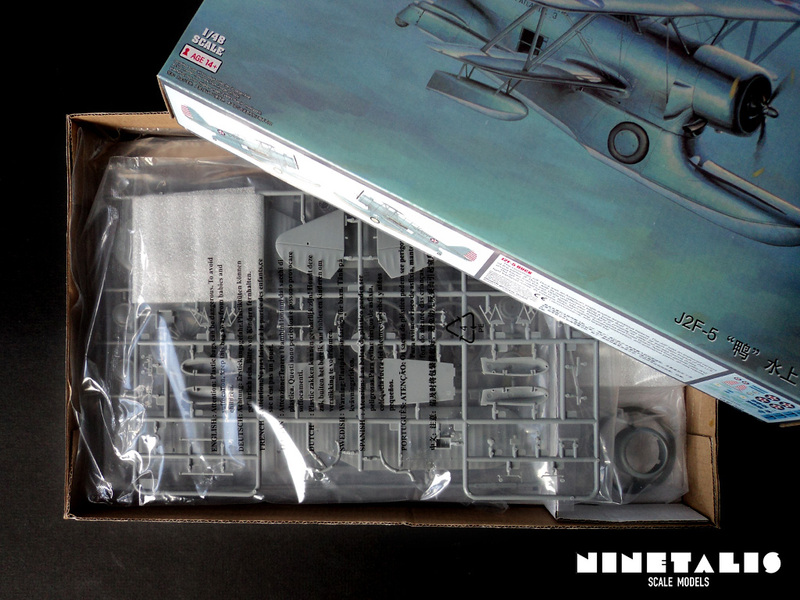 This is a great kit of an aircraft that has been tackled a few times in 1/48 but proved troublesome to either find or build. The Glencoe Models was actually a 1/50 scale kit and not the most detailed, the Classic Airframes is quite expensive and not the easiest to construct. Most important of all, both are quite hard to come across. This Merit kit is therefore a very welcome newcomer of a recently established company from a holding that has proved itself with its own kits, which is obvious to see when looking at this kit. The detail is nice and during test fitting the kit seemed to go together extremely well! However, the detail inside the cockpit could have been a bit more and a little bit finer. It should not be something a basic modeller should worry to much about. The only real issue that I assume someone could have is the lack of a canopy framing in separate parts (so that the cockpit can be displayed open), the lack of the dorsal gun and the price. 40 euro’s isn’t cheap for a kit that is a little bit basic, which is odd comparing to their previous PT Boat kit which was enormous, detailed and ‘only’ costs around 70 euros (for something so large), but on the outside, nobody will truly be able to notice the absence of these items from afar. 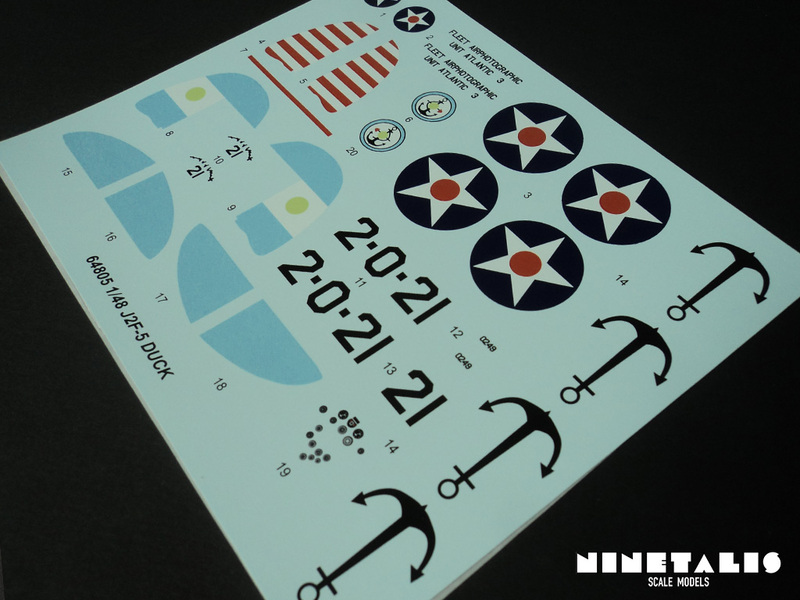 Seeing Merit keeping its focus on WWII Navy subject in 1/48 is good to see, and I can’t wait to see more from them in this scale. As such I will be looking forward to a few more variants of the J2F Duck like a version with depth charges, rescue aircraft version or a target tug. 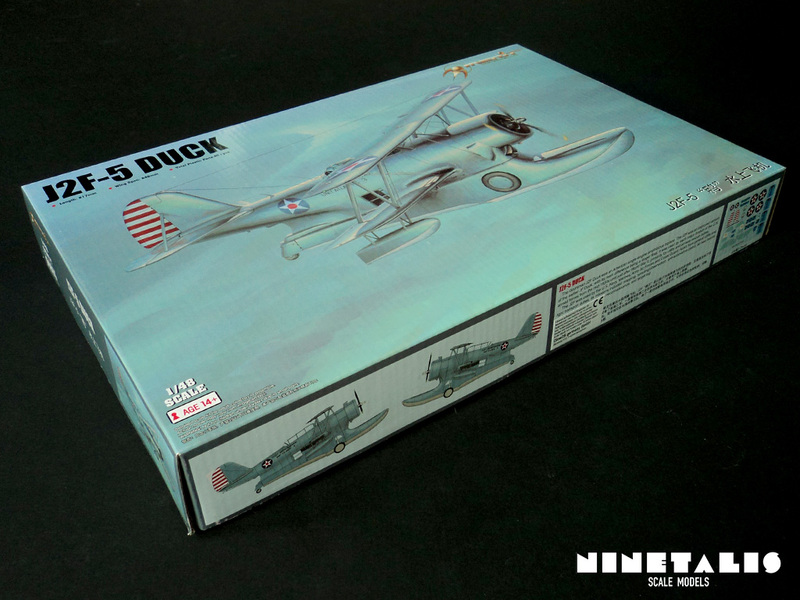 The price is a little bit steep on one side, but it is definitely the best/easiest Grumman Duck out there in any scale and recommended for any skill level, especially those who have an interest in both US and South-American Naval aviation.